SwedishRider is the blog for Johan Lundin who is a 33 year old Swedish adventurer currently crossing South America on a motorbike. 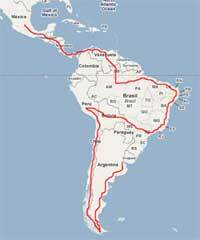 The trip started on March 17th, 2008 and will finish in the end of 2008. Johan normally lives and works as a software developer in the financial industry in London, United Kingdom. 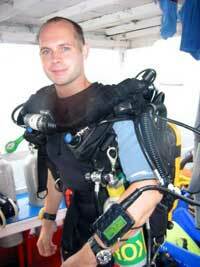 His spare time interests include alpine climbing, technical diving, snow boarding and dirt bike riding. 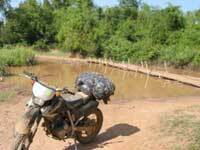 Previous motorbike trips include crossing Thailand, Laos and Cambodia on a Honda 250 XR. A light bike is nice when the only way forward is deep mud or, as seen in the picture, thatched bamboo bridges. 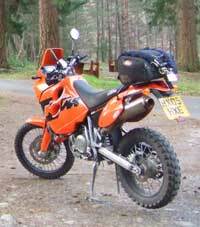 This time the bike for the trip is a KTM 640 Adventure. It has a 25 litre tank which gives the bike a range of 500 km. The bike itself weighs 160 kg but the full weight with fuel, packed panniers and rider is around 300 kg. The bike was bought a year in advance of the trip in order to get accustomed to the bike and be able to repair the bike in remote areas with no help from mechanics. One part of preparations has been off road riding the so called "Green Lanes" around London. These unpaved roads and trails are the only places around London where you are allowed to take motorbikes for off road riding. A few trips to motocross tracks have also been included early on. The movie to the left will give you a preview of what off road riding on Green Lanes is all about.